You've certainly seen the photos of the opening of Expo 2010 in Shanghai - pretty exciting and we can't wait to be there next month. San Francisco is the only city in the world with an official participation; "San Francisco Week" in Shanghai will be June 17-25. We'll be singing at the Gala San Francisco dinner, visiting the Conservatory, doing a performance in another city and seeing what we see! Our delegation will be headed by Senator (and former SF Mayor) Dianne Feinstein and Mayor Gavin Newsom. Other members of the performing delegation will be singers from Glide Memorial Church, dancers representing the Irish, Samoan, and Mexican cultures, and instrumentalists from the San Francisco Conservatory. 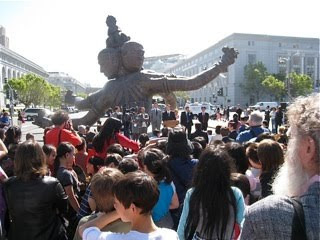 In honor of the 30 years of friendship between San Francisco and Shanghai, Mayor Newsom today 'unveiled' ( as it were - it's too big to get a veil over) a copper sculpture by Zhang Huan which will live here for l8 months. We'll see it when we get home next week. 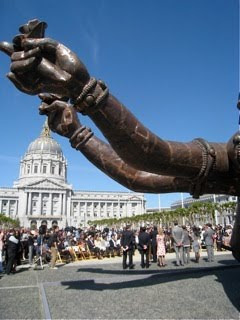 It's 26 feet tall, 15 tons, called Three Heads Six Arms and represents the arms legs feet hands and heads of Buddhist sculptures. 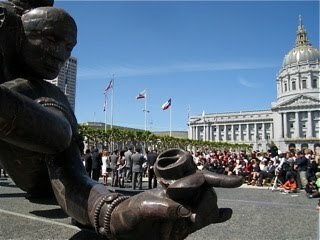 An eclectic group of San Franciscans (there wouldn't be any other kind...) greeted the addition to City Hall Plaza. 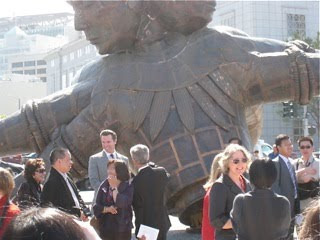 James Fang, Chairman of the Sister City Committee spoke about the coming S.F. week in Shanghai, and the participation of Chanticleer and others in the delegation. It all begins to be real... we have a few things to do first, but this time next month, we'll be flying to China!